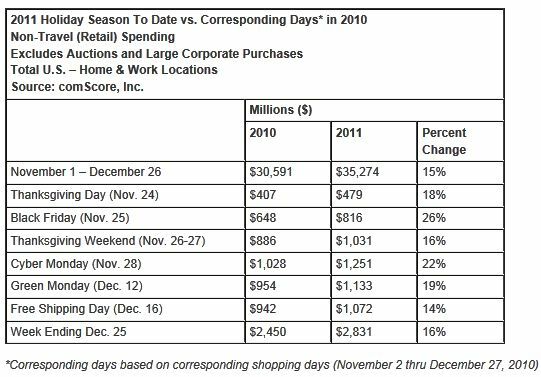 comScore reported holiday season retail e-commerce spending for the first 56 days of the November – December 2011 holiday season. For the holiday season-to-date, $35.3 billion has been spent online, marking a 15-percent increase versus the corresponding days last year. The most recent week (ending Dec. 25) witnessed $2.8 billion in spending, an increase of 16 percent versus the corresponding week last year. One of the interesting e-commerce phenomena occurring over the past several years is the dramatic increase in Christmas Day purchases of Digital Content & Subscriptions, a retail category that includes digital downloads of music, TV, movies, e-books and apps. Not surprisingly, as many consumers get new smartphones, tablets, e-readers and digital content gift certificates for Christmas, they spend Christmas Day loading up their devices with new content. On an average day during the 2011 holiday season-to-date (Nov. 1 – Dec. 26), Digital Content & Subscriptions accounted for 2.8 percent of retail e-commerce sales, but on Christmas Day the category accounted for more than 20 percent of sales. 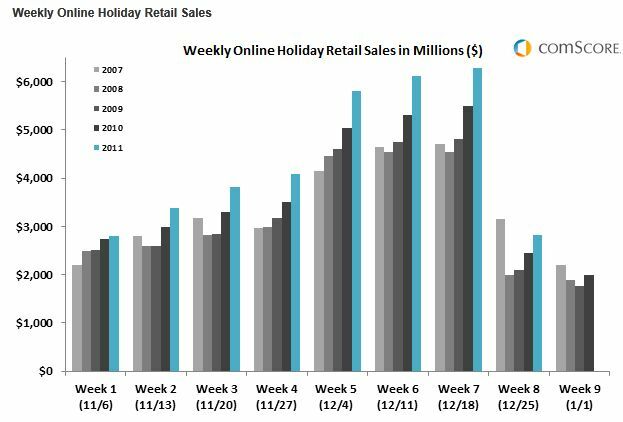 Consistent with past years, comScore expects sales for this category of products to remain elevated throughout the entire week following Christmas Day.